The Dak here, back from a lovely vacation at the Bates Motel to talk about whether or not you should buy The Lord Discordant. 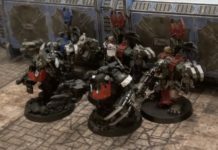 So, Games Workshop has been putting out a lot of new stuff for chaos. There is honestly a lot to cover, but today we are focusing on the entirely new Lord Discordant. On a completely separate note it turns out my predictions were actually fairly accurate. Lets dive in shall we? So the Lord Discordant has a fairly interesting stat block. The Lord Discordant rocks a fantastic weapon skill and ballistic skill, akin to a chaos lord. Interestingly his base strength is only four, but seeing as nearly all his weapons increase this it hardly matters. Aside from that one weird scenario where a GSC player brings webbers. Toughness six puts him at daemon prince level as far as getting wounded is concerned. The Lord Discordant has four attacks base, but don’t let that trick you, this thing gets a ton of extra attacks from the mount and some wargear. In addition, he’s got a nice 2+ save and 5++, which helps him shrug off your average bolter round. The one detail i’ve saved for last, and the thing that some may find problematic is the fact he has twelve wounds. This is important, as he cant hide behind a blob of cultists like a daemon prince can. Meaning your opponent is most likely going to target him. 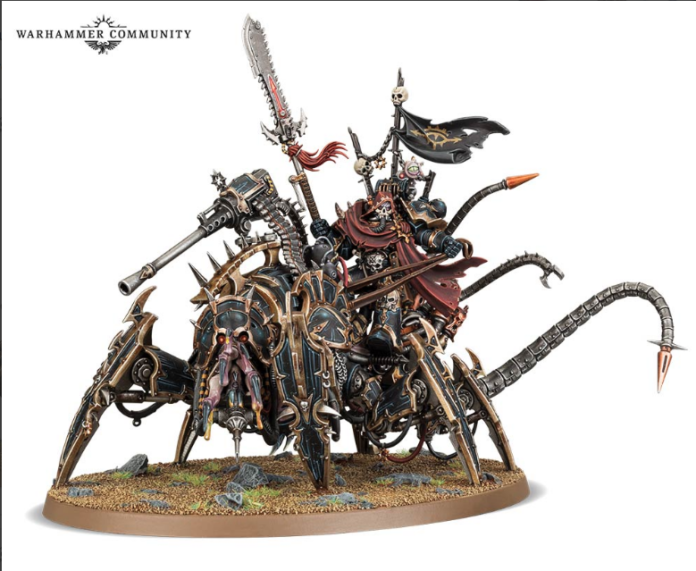 I would almost describe him as a Chaos version of hive tyrant. The Lord Discordant is big, killy, and scary, and people are going to want to throw Lascannons at him. Here is why. The Lord Discordant comes in with some spicy wargear. For starters, he always has his trusty chainglaive. While it only adds +2 to his strength it does have a special condition that doubles it instead if you charged. Also, the Chainglaive has a very respectable -2 ap and a flat 2 damage. Plus, he has those two extra Mechanadril attacks, which aren’t groundbreaking but nice to have. However, lets not forget the mount that comes in with around 5 attacks of its own. The Hellstalker always has his bladed limbs that would be at strenghtth 7 -2ap and d3 damage. However, the number of attacks do degrade with the models profile so that is somthing to keep in mind. The Helstalker has the option to take a magma cutter on its face that works just like the ones the Maulerfeind can take, but I think the technovirus injector is much more interesting. It is streangth 8 ap-4 and does d3 damage, but the cool part is that if you wound a vehicle it does an additional d3 mortal wounds. By this way this goes off as long as the wound roll is successful, it doesn’t matter if your opponent saves the regular damage or not. Now this part is pretty straight forward, The Lord Discordant has two gun options. He can either take the Autocannon or the baleflamer. Either one is a decent option, but the autocannon is cheaper and you have a very nice BS 2+ so I personally like the Autocannon. Don’t forget the Lord Discordant has an aura that gives himself and other daemon engines +1 to hit. So, you dont even suffer the penalty for moving and shooting. The Autocannon also gives him the ability to threaten units at a longer range. Firstly, The Lord Discordant has the usual death to the false emperor and 5++ save for being demonic. Also he has Infernal regeneration, just like all the other daemon engines. The big reason to take him is his aura of discord. He gives friendly daemon engines a +1 to hit, this applies to both shooting and fighting. Additionally, it forces a -1 to hit for enemy vehicles within 6″ which is nice against dreads and knights if you can get close enough. He also has spirit thief, which basically means that if he kills a vehicle he can either repair a daemon engine within 3″. Conversely, he can instead shoot an enemy vehicle within 12″ for d3 mortal wounds instead. Ok, so you are probably wondering who he should hang out with. The obvious answer is Daemon engines, but lets look at that a idea a little closer. The forgefiend option is a decent one, as having them hit on 3s is great. However, the Lord Discordant really wants to get stuck in so a pack of Maulerfiend’s might be a better option. Interestingly i think one of the best options might actually be the new venomcrawler. The reason being that their weapons are assault so they don’t mind moving up the field with the Lord Discordant. Venomcrawlers are also decent in close combat and would benefit from the +1 to hit in all scenarios. Unfortunately the only way to get a venomcrawler right now is in the big boxed set, but an individual kit will almost certainly come out in the next month or so. Next, lets look at some of the wombo combos and synergy. The Lord Discordant has all the right keywords for some serious shenanigans. One obvious Synergy comes from the CSM codex, as the new greater possessed and staples like casting diabolic strength on him are good ways to make him hit even harder. This can get even crazier by marking him Nurgle and keeping a Herald nearby. You could also cast blades of putrefaction on him to add +1 to wound rolls with 6s doubling his damage. Plus there is another option with the new and improved Dark apostle being able to trow on another +1 to wound. Nurgle marked Lord Discordant can also benefit from miasma of pestilence, and the Dark Apostles ability to throw yet another -1 to be shot at. Plus, there are a tone of other relics, warlord traits and psychic powers from the Chaos Daemon codex that could be useful on the Lord Discordant. In Fact i could Probably write an entire separate article on what stuff would work with a Lord Discordant. A resounding yes, you should get one. Especially if you run Daemon Engines. The lord Discordant is a lot like a Hive Tyrant in many way’s and while he can be shot at, there are a lot of ways to buff him and make him very tough to bring down. As far as crunch goes he’s potentially more killy than a Daemon Prince. Not to mention the specialist detachment, unique relic, and warlord trait that make him even better. So yes, i’m planning on getting at least one at MINIMUM.